How to apply a downloaded style? How to add Google AdSense? How to add Google Analytics? How to use a image as header background? How to integrate a logo in the sidebar? How to hide empty namespaces from the sidebar index? How to make the height of the page bigger by default (not IE compatible)? How to change the search button to an image? The editing toolbar is missing, what can I do? How to change the width of the search field? How to reference images in a custom sidebar? Can I hide the Pagename at the left top of the header? How to include links for dw2pdf plugin and/or bookcreator plugin? Namespace sidebars not working in root namespace? Features: html5, sidebar (left/right/both/none), definable User-/Group-/Namespace-Sidebars, fully configurable via configuration manager, TOC inside sidebar, user defined sidebar actions. I created the Arctic template to let DokuWiki look more like a CMS. The template provides a sidebar (left or/and right) which is built from normal Wiki pages. It also provides sidebars which are only visible to certain users or groups. Furthermore it is fully configurable via the configuration manager. For Angua the location of the latest downloads changed. To update using the plugin manager you have to delete and reinstall the plugin. Refer to template on how to install and use templates in DokuWiki. These are the different sidebar types. extra There are 2 new files inside <dokuwiki>/lib/tpl/arctic called left_sidebar.html and right_sidebar.html which will be included if you select the extra type. This comes in handy for example if you like to include Google ads. If you like to use the user- or group-sidebars you have to set up your <dokuwiki>/conf/acl.auth.php the right way. This is an example setup for a user “tom” (User-Name: tom) who is a member of group “@user”. The “user sidebar namespace” is set to “user” and “group sidebar namespace” is set to “group”. We will grant him write/page-creation/upload permissions for his own namespace and read/edit permissions for the group:users namespace to everyone who's part of the group “@users”. First of all, you would probably like to create the main sidebar, i.e. the sidebar associated with the root namespace. You simply have to create a wikipage called sidebar—or whatever you set pagename to— and add some links. TIP: It is possible to create this page right in the wiki. Go to any page of your wiki and change the query string of the URL (in your browser's address bar) to '?id=sidebar'; then just create this page. If you've enabled user sidebars you can add a sidebar for each registered user. All you have to do is create a wikipage user:username:sidebar. Note, this feature depends on a proper acl-setup. If you use @USER@ inside this sidebar it will get substituted with the user name of the logged in user. Group sidebars are set up just like user sidebars. For example, to create a sidebar visible only to those in the admin group, you would create one named group:admin:sidebar. If you use @GROUP@ inside such a sidebar it will get substituted with the group name of the sidebar. If you've enabled namespace sidebars you can add a sidebar for every namespace you like. Thus the naming scheme is the same for all sidebars, the only thing you've to do is create a page called, you guessed right , “sidebar” inside the desired namespace. This sidebar, then, will only show if you browse pages within this namespace. The template also supports custom sidebars. You can create your own custom sidebar by creating a new subdirectory inside <dokuwiki>/lib/tpl/arctic/sidebars/ and putting a file called sidebar.php in there which holds your PHP code, i.e. <dokuwiki>/lib/tpl/arctic/sidebars/<sidebar name>/sidebar.php. Then you can activate the sidebar by adding its name to the comma separated list of other sidebars in the arctic template settings. add “helloworld” to the list of comma separated sidebars in the configuration manager. Here's a list of other custom sidebar examples. Here are some more examples of custom sidebars for the arctic template. Feel free to contribute, just post your custom sidebars to this page ! How can I get current id highlighting to work? I copied the following into arctic_layout.css and layout.css in the arctic template folder, but it didn't work. I'm interested in integrating this into my arctic template. Shows the backlinks to the current viewed page. You have to add “backlinks” to the comma separated list of other sidebars in the arctic template settings. // Could we not use  noNS($dataList[$i]["id"]) instead??? // FIXME: Why is this needed when the same happens down below? The substr operation is necessary to ensure that DokuWiki generates XHTML-compliant code: the output of the clock plugin is encased in a <div> block, but simply calling p_render will surround that with a paragraph block, causing incorrect behaviour. You can use free icons from http://nouveller.deviantart.com/art/Social-Media-Bookmark-Icon-125995730. in admin add translation to your comma seperated list of sidebars. The template style (colors/font-sizes/width) can be widely configured via the style.ini file located in <dokuwiki>/lib/tpl/arctic/style.ini. You can modify the look of the template by editing the style.ini file and change the values to your needs. The best way to check out which part of the template is affected is to view the syntax page of your wiki, then edit the style.ini and see what happens. These are the substitutions introduced by the arctic template. If you've created a style.ini that you like to share with the world, you can upload it to this Wiki and insert it in the table below. All you need to do to be able to upload files is register yourself and get an account. Of course you can send me an email with the style.ini and a screenshot too . Just copy the downloaded style.ini to <dokuwiki>/lib/tpl/arctic/style.ini (you may want to backup the old one first!). If nothing happens after the first page reload you need to touch <dokuwiki>/conf/local.php or reload the page using <CTRL> + <SHIFT> + R. That's it! The template was tested with the following Browsers. If you've seen it working with other browsers feel free to add them to the list ! The configuration settings descriptions still need to be translated to other languages. If you like to help, send the translation of the below files (the file needs to be UTF-8 encoded). You can also use one of the many available index [[doku>plugins]]. For further information about sidebars refer to the template [[doku>template:arctic#first steps|documenation]]. Some of the Ideas are taken from the other great DokuWiki templates. Furthermore a big “Thank you!” to the great DokuWiki team for your very good looking and well structured default template and this cool Wiki! 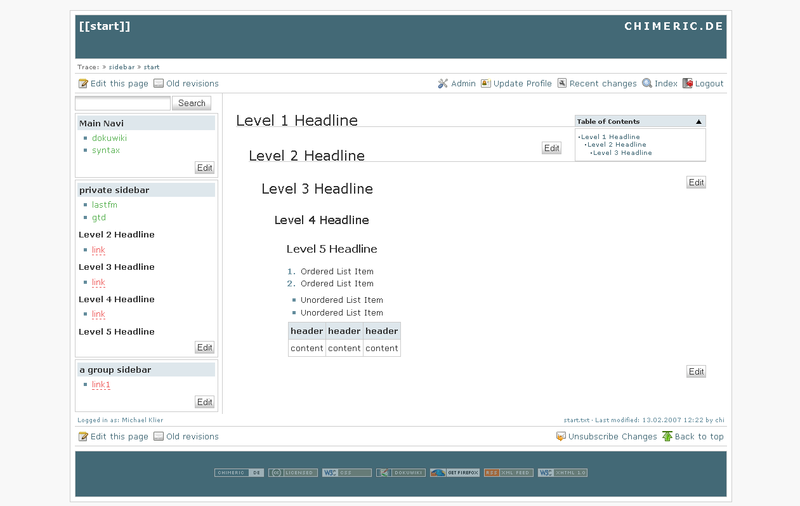 http://bibliopedia.ptcvic.org – great template. Shame someone doesn't write a decent add new page plugin. Quantum Measurement and Control – A website about a book on quantum measurement and quantum feedback control, many thanks for the template. STAToolkit Wiki – Our sincerest appreciation for a wonderful template! http://www.chennaibus.info – A website on complete information on an Indian City, Chennai - Bus Routes on web and mobile. http://www.chennaitrain.info – A website on complete information on an Indian City, Chennai - Train Timings on web and mobile. http://informatica.temuco.udelmar.cl/~lmachuca/dokuwiki-lucho/ – my website, development of plugins for DokuWiki, and some personal stuff. http://www.seirios.org/~seirios/dokuwiki/ – Web site of “ほほほのほ” for Technical and other memos Wiki in Japan. http://www.madesimple.de/inkasso-kochbuch - Das Inkasso-Kochbuch der Anwaltskanzlei Lueneberg. http://doctoryoo.pe.kr - Korean wiki, modified. http://wiki.vehtoh.de - a semi-private, outsourced Brain (powerd by Dokuwiki and your great (little bit modified) template ;), feel free to contact me for the coffee!!! http://weidewiki.org - Das Portal rund um Weideprodukte in Deutschland, Luxemburg, Österreich und der Schweiz bedankt sich für das Template! http://wiki.miiconsola.com - MiiConsola Wiki (Spanish). Videogames, consoles, tournaments, etc. Trace Libre : blog of a research in information and communication science. I always have a problem with dates of posts (I can't make a reindexation every time I change a namespace), but this template makes me happy, thanks ! lingue.at - private homepage with some minor changes in the arctic template. Thx!! and insert the AdSense code before the closing div. If you want AdSense to show up in the footer just insert the required lines into <dokuwiki>/lib/tpl/templatename/footer.html. Then edit <dokuwiki>/lib/tpl/arctic/style.ini and set __header_height__ and eventually __wiki_width__ according to the dimensions of your image2). Just put your logo in <dokuwiki>/lib/tpl/arctic/images/ and edit <dokuwiki>/conf/userstyle.css3) and add your logo as a background image to div.dokuwiki div.left_sidebar or div.dokuwiki div.right_sidebar, e.g. Wouldn't it be easier to insert an image using standard wiki images? You can use for example the navi plugin in a sidebar as an alternative to the default index. Of course, you can change the min-height property to whatever you want. Here's a little CSS trick. You may have to play with the padding value a bit, it just moves the text away from the image - and you have to choose the color value to be of the same as your background in order to make the text disappear. In your <dokuwiki>/conf/userstyle.css5) add the following. You can set the width by adding the following CSS to your <dokuwiki>/conf/userstyle.css6). A quick and dirty way is to add some CSS. See here or here (french version). Search for the <div class=“bar-left”> and move down to case('links'). Hi! First of all, thanks for the great work. May it be that namespace sidebars are only shown within namespaces deeper than the root? I got a bilingual page using the translation plugin. German pages are in : and english ones in :en: I want arctic to show a german left sidebar (file: :sidebar.txt) within the German pages and an english one within the english pages (file: en:sidebar.txt). Funnily, the english one works, while the german does not. Furthermore, I want to show localized versions of the right sidebar also. Is that possible? I don't really see a way without messing with the template code itself … Thanks for your answers! I had to add “overflow:hidden” to “div.dokuwiki div.left_sidebar”, because otherwise long entries in indexmenu Plugin would cause the main area to break and appear under the sidebar when using IE 6. This solution leads to a scrambled layout as the DIV section with the indexmenu has no right border any more..
Is there anything to do in the .css so that IE accepts the width of the DIV instead of making it wider? I am just wondering: You are using a sidebar with fixed width. What do I have to change in the style.ini to get that? Thanks! In the last version, it seems that the file to modify is dokuwiki/lib/tpl/arctic/arctic_design.css. And you need to change the div.center_page too (in the same file). First, I would like to thank you for excellent work! Templates you created are really wonderful. I have a little request, I found that many users found the backlinks in a header (the link on a left side in a squared brackets) - confusing. If you have settings to show the first header of page as a text of link. This link looks like a header of the current page. And it is located in the place where many websites put their name which suppose to lead them to the main page of the website. The user clicks on this link, sees the backlinks page (which often does not have any links) - and gets confused. It would be nice if in configuration settings for template we had a settings which allow to hide those backlinks and to put the website name on a left. Otherwise we need to change CSS of the template. Has a fix for this been completed? If I use the above recommendation how do I use it? I don't know anything about CSS. Do I just create a userstyle.css and put that line in it? Please help. Yes, just create that file put it into the <dokuwiki>/conf directory and your done. – I'm wondering the same thing. This test above can use a black list of namespaces to don't show the sidebar in specified cases. I made it by changing the dokuwiki/lib/tpl/arctic/tpl_functions.php. The last function tpl_sidebar_hide is modifed to look for pagenames too. Unfortunatly you need to “hardcode” every page you want to hide in this file, but I only need a single page without the sidebar. Change in $id_hide the pagenames you need without a sidebar. I am using this template to display the wiki index tree in the sidebar. The wiki uses the iptrust plug-in to be freely accessible from our office but force login from outside. So, while no content is presented without login, the sidebar still is. It is no option to disable it for not logged-in users, because of the IPTrust open-within-the-office feature. Et voilà: Because IPTrust shows the login page for not logged-in users, the sidebar is perfectly hidden. 2011-05-16: A new maintainer for this template is needed. Have a look at the following if you are interested: 1, 2. - I would prefer the sidebars to be hidden in the full page mode of the media-manager. Chimeric did this for the admin and diff-views too. The center-page lacks space with this template, »overflows happen everything is a bit tight. I use “translate3” plugin. I create 2 custom sidebars for 2 language. Is it posible to change sidebar with language? (I tried to use file “nosidebar.txt” in different languages but it not work. DokuWiki used this file in “En” folder only). Also please add bug-tracker link. Thanks. Help!!!! Media Manager not working. After click the button the page of manager is total mess and If select a file for uploading… It said that after the file name “failed” . Most probably a cache problem. Try touching (updating the timestamps of) style.ini. when creating a new translation of a page, the “main box” of my left sidebar (id =sidebar ) disappears but the “extra box” (translations) remains. Someone has already had this issue? Did you try translating the sidebar also? The translation plugin might change the namespace so arctic will look for the sidebar in the namespace of that language. the table of contents lies over tables (normal text areas flow around the table of content, but if the page starts with tables, the toc-area converges with the table) - how can I fix it? For public sites with lots of users, is it possible to only let admins edit/create pages named “sidebar”? So no one else gets to change how the sidebar looks and what's in it. in the <dokuwiki>/conf/ folder; not arctic/conf/! Just create it if it doesn't exist.